About The Author: J. Alchem has proudly taken many award home which includes - Amazon Pen to Phblish Award, The Best Author of the year award 2017-2018, StoryMirror and Superhero storyteller award.Clearly he has been making Indian authors proud. Head on to his website to know more - J. Alchem. About the Book:The Blurb Says: मैं पहली बार छह: महीने पहले मिला था उस से. अख़बार डालने आता था वो हर दिन. फिर एक इतवार के रोज़ वो अख़बार के साथ साथ एक कहानी भी ले आया. मुझे सुनाने को. सुनते सुनते पता चला की वो कुछ पन्ने थे, जिन्हें वो उलटा पढ़ रहा था. एक कहानी में पिरो कर. 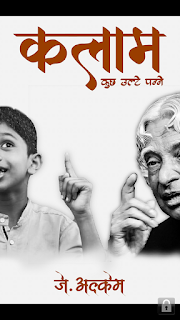 एक कहानी जिसमें वक़्त पीछे की ओर भाग रहा था.What I Felt About The Book:“Kalam: Kuch Ulte Panne” - I am not sure if the readers or the author is going to like it, but the truth is that I picked this book by mistake. I liked the title and as many times I do, I did not not notice that it’s a Hindi book! But all is well that ends well - I was glad that the lines were not the typical ones we used them dread and had to pronounce carefully!Coming to the story line, it’s not something readers would expect but they are going to enjoy every bit of it. The description about respected former president Dr. Abdul Kalam kept me smiling and nodding all the time. It had a unique mystery around the lines which kept me hooked. There were some errors in the “matras” and grammar which I was so relieved that the author gradually thought upon and conveyed that he would get them corrected. Now, I did not intend to keep this section, but guys, this paragraph is only here because I truly liked the attitude Mr. Alchem has displayed. Kudos to you dear. I am sure the readers are going to get many more wonderful stories. Luckily, I picked up the book even if it was by chance, It was a thoughtful and story reminded me of old stories I used to read in Hindi newspapers during my school days. It was a one time read, but a very thoughtful and good one.